58%, 71%, 76% of respondents in Germany, Austria and Switzerland respectively, connected to the Internet through a mobile device. Ttablets are more popular in Switzerland (26%) for mobile Internet use than in Germany and Austria (17% and 16%). 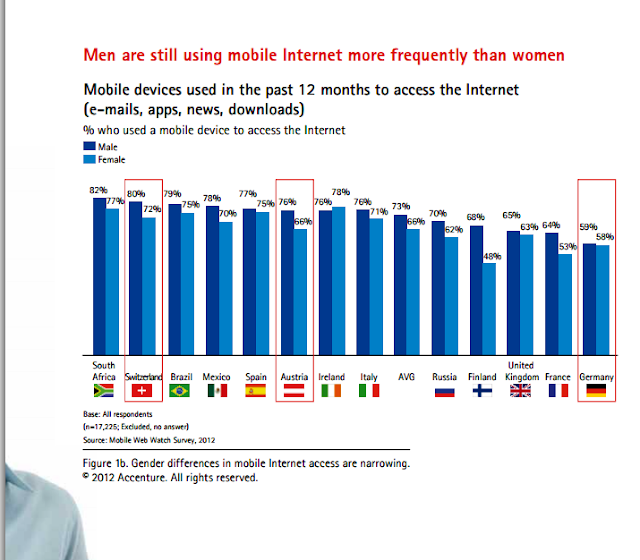 59% of men in Germany compared to 58% of women used mobile Internet; in Austria it was 76% of men vs. 66% of women; Switzerland (80% vs. 72%). 48% used mobile Internet for personal matters compared with 15% for work-related matters; Austria (59% vs. 22%); Switzerland (64% vs. 26%).